Rastrellis church of St. Andrew in Kiev blended Russian motifs into the Western baroque style, transforming the traditional onion domes into elegant sculptural ornaments. It was the Empress Elizabeth who laid the first stone in this church in 1744. The whole idea was that the Empress was now ruling over the southern steppe as well as the northern forests and this would be a centre of power and a chapel in which the Empress, whenever she was to visit the south, would come and worship. 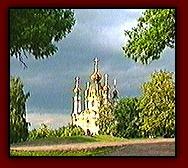 St. Andrews was a dramatic church illustrating the profound Western influences and the whole new world where architecture dominated Russia with statuary and elaborate decor rather than the old flat, ethereal and spiritualised icons of old Muscovy.